Years ago, on my first thru-hike of the John Muir Trail, one of the many surprises was how many man-made objects were dispersed over the 211 miles. Don’t get me wrong — I’m not complaining. I didn’t find anything built along the trail that spoiled the feeling of being in the wilderness, it was just unexpected. Runners up to the most famous of the man-made structures have to include the bridge over Woods Creek and the hut that sits atop Mount Whitney. 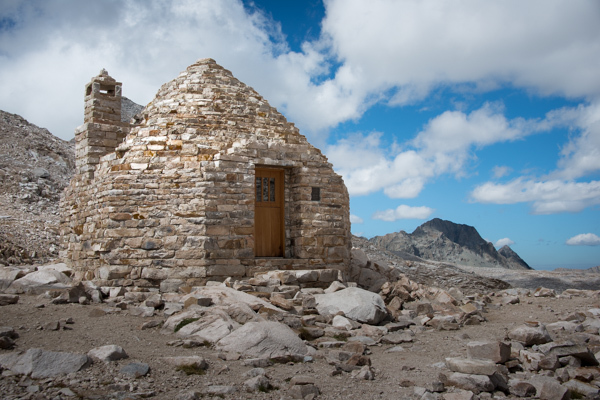 The most famous is indisputable: the Muir Hut at the top of Muir Pass. The hut was built in 1930 and dedicated two years later. As indicated on the plaque, the work was financed (all $5,810.48) by George Frederick Schwarz. Anyone who has ever visited the hut has probably sat inside, looked up, and wondered why it has stayed together for over eighty years. The hut was designed by Henry H. Gutterson, a California architect who studied in Paris and was a prolific designer in the Bay Area, particularly in St. Francis Wood. He got the idea from the trullo huts of Italy. 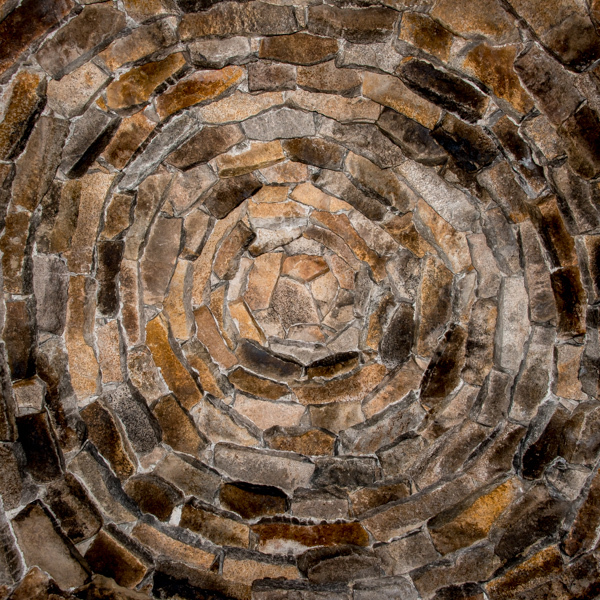 The ceiling of the hut is a work of art in its own right. 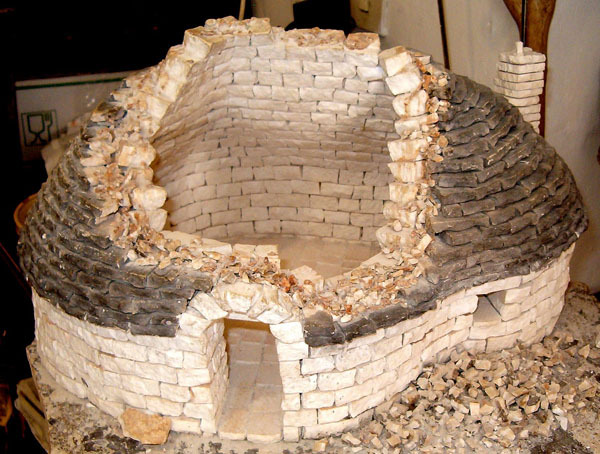 This model (photo courtesy Marcok) illustrates the intricacies of a trullo hut’s construction. 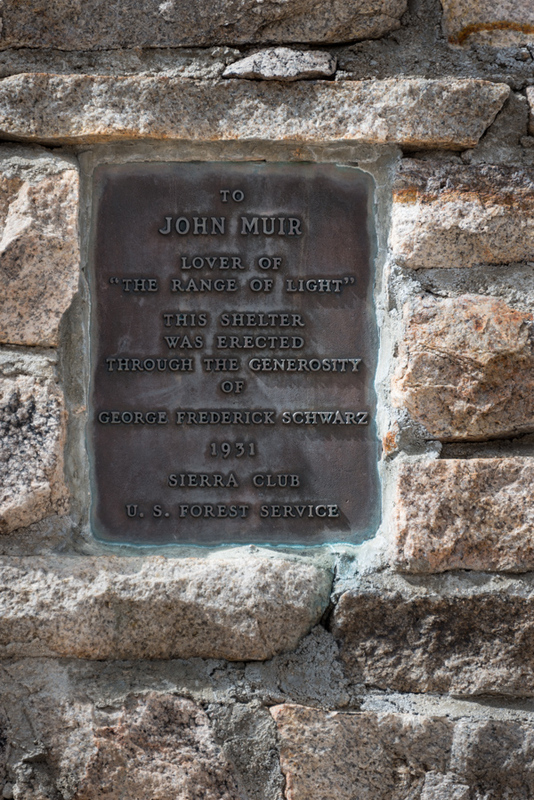 dedicated to the memory of John Muir. hikers caught in storms on this exposed section of trail. Overnight camping and fires are prohibited. 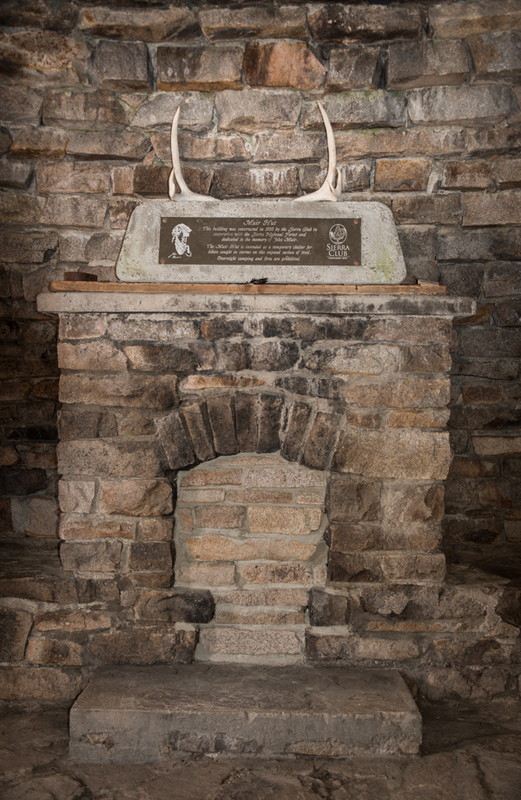 In her book, “Highs and Lows on the JMT”, Inga Aksamit notes that Muir Hut is not very storm-worthy, nor is it a safe place to hole-up in the thunderstorm. Do you concur? Thanks for the interior views. It looks like a really neat structure. Stone huts are generally not considered safe in a thunderstorm. But then, the top of a pass is NOT where you want to be when lightning is in the area. If it was an unexpected snowstorm it would provide good shelter, although, depending on the circumstances, it might make more sense to get lower before the snow got heavier. Thanks for the comment! I’ve been there in a thunderstorm, over 40 years ago. I seem to have survived! But what a place to weather a storm! Wow…I’ll bet that was something. Thanks, Amy! Not sure how often they do maintenance, but when we went through in 2013, they were doing all sorts upkeep (sealing the windows, fixing the door, etc.). They were there for at least a few days with tools and supplies brought in by pack mules. Interesting, Keith. Thanks for the comment! Bill Crim and I hiked that portion of the John Muir Trail in ~1960. It was a VERY cold and rainy day. Ice was coating our jackets. As we climbed towards Muir Pass from Florence Lake, we started chanting “People don’t die of exposure in the Sierras any more” … and then we arrived at the Muir Hut. The door opened swiftly to greet us and we soon had cups of hot coffee in our hands. No less that ten hikers “slept” there that night. Definitely a fond memory. We woke to gorgeous blue skies and were soon on our way south to Little Pete Meadow with its many beautiful wildflowers. Great story, Jim. Thanks so much for the comment! Robert ‘Bob’ Douglas Page, David Lawrence Huffman, and I visited on our JMT walk 1 – 15 July 1966.